One has to have passion for the sea and be enchanted by the aura and symbolism of the Atlantic Ocean. In the case of Andrés and his father, Andrés Sr., both avid sailors, and both immigrants under very different circumstances, all the right ingredients are there. 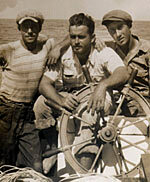 Once in Cuba Andrés Sr. (pictured here third from the left), or Abuelo as we all call him now, worked for an uncle who owned a fleet of fishing ships. But being the nephew of the owner he often got the short end of the stick from all the other fisherman. Abuelo spent many days and nights at the sea working and fishing and getting a real-life education. You would think that someone who spent a chunk of their youth working and fishing on the sea would not like it as an adult. But to the contrary, this is where Abuelo developed his respect and love for the sea. It is to celebrate this first voyage across the Atlantic on the Marqués de Comillas that we have named our sailboat O’Comillas. (Note from Kristi, the editor/wife: I can see that the photo links aren’t working and I’ll try to fix them, but I can’t promise anything since my technological capabilities are limited, and my usual IT dept. is, of course, in the middle of the ocean. You should also know that as entries are posted, I’m editing them for spelling & punctuation. I would love to be able to translate the Spanish entries, and I’ll try if I have time.